How exactly does a wind turbine convert wind into electricity? How much electricity can a wind turbine produce? How much space does a wind turbine require? Could Wind Energy provide 100% of Ireland's energy needs in the future? If possible, how many wind turbines would that require? What are the job opportunities in the Wind Industry? Do wind turbines impact on health? In simple terms, the wind turbine produces electricity by using the kinetic or moving energy of wind to create motion. The force of the wind causes the turbine blades to rotate and this in turn rotates a drive shaft. This is made possible by the special aerodynamic design of the blades which results in the speed of the wind leaving the turbine being less than the speed of the wind approaching it creating a spinning effect. This rotating motion of the drive shaft fed through a gearbox delivers the motion required for a generation unit to produce electricity by using the motion to create a magnetic field and generate an electrical current. The amount of electricity that a single turbine is able to produce depends on its size, the wind speed and the efficiency with which that specifically designed turbine is able to convert wind energy to electrical energy. A modern wind turbine produces electricity 90-95% of the time, but it generates different amounts depending on wind speed. Over the course of a year, it will generate about 31% of the theoretical maximum output. This is known as its capacity factor. By comparison the capacity factor of conventional power stations is on average 50%. The larger commercial turbine towers are made of steel, generally painted light grey. The turbine blades are usually made of a matrix of glass-fibre reinforced polyester or wood-epoxy or a similar composite fabrication technique. They are generally painted light grey because this is the colour which is most inconspicuous under most lighting conditions. The finish is matt, to reduce the potential for excessive light reflection. A "nacelle" or enclosure is where the generator and gearbox are housed. Wind turbines come in many different sizes, depending on the amount of energy that it is required to produce. The larger the turbine, then (generally) the greater the amount of electricity produced. For most modern commercial turbines the tubular steel towers range from about 200 to 400 feet (60 to 120 metres) in height. Typical heights for modern commercial turbines in Ireland now are now in the region of 156m. Wind turbines typically start operating at wind speeds around Beaufort Force 3 (which is around 3-5 metres per second (m/s), or 8-12 miles per hour (mph)). Turbines reach maximum power output at Beaufort 5 (around 11-14 m/s or 25-30 mph). At very high wind speeds, i.e. Beaufort Storm Force 10 winds, (around 24 m/s or 55 mph) or greater the wind turbines shut down to prevent excessive wear and tear. Since winds of this strength occur only for a handful of hours per year, very little energy is lost in high wind periods. Large scale wind turbines blades typically rotate at somewhere between 10-25 revolutions per minute. In the past, most wind turbines rotated at a constant speed, however, most modern turbines now operate at variable speed, for greater efficency. The theoretical maximum energy which a wind turbine can extract from the wind blowing across it is just under 60%, known as the Betz limit. As the wind turbine extracts energy from the air flow, the air is slowed down, which causes it to spread out. Albert Betz, a German physicist, determined in 1919 that a wind turbine can at most extract 59% of the energy that would otherwise flow through the turbine's cross section. There are different spacing requirements for different types fo turbines, so the amount of space required by a wind farm depends on the number and type of turbine being deployed. A typical wind farm of 4-5, V90 3MW turbines might extend over an area of 1 square kilometre, but only 1% of the land area would be used to house the turbines, electrical infrastructure and access roads; the remainder can be used for other purposes, such as farming or as natural habitat. 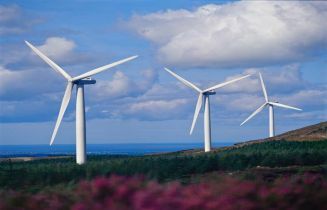 While it would be technically possible to install enough wind turbines to meet the future annual total electricity demand of Ireland, given the current technological limitations this would be highly unlikely. The problem is that while wind energy created might meet total demand over the year, Ireland is a relatively small meteorological area and there are going to be times where electricity generation is extremely low due to very load wind speeds across the country and similarly periods where generation exceeds demand. The only way in which one might solve this problem would be to have the national grid fully integrated with a much larger electrical grid such as the UK or Europe, where we could import electricity in times of shortage and, and export energy in times of surplus. Even then, the connections required to safely import periodically the majority of the country's electrical demand would make the scenario highly unlikely. The most likely long term sustainable solution to Ireland electrical would be the contribution provided by other renewable energies such as wave, tidal and bio-mass in addition to wind energy. To answer this question we construct a estimate given the latest available information, combined with a number of assumptions. The 2012 Eirgrid All Island Generation Capacity Statement, returns a median demand forecast for the year 2012 of 27,336 GWh for ROI. Given this demand we shall construct the figures on the basis of a 3 MW turbine with a 31% load factor. Given this demand and these assumptions, as few asaround 3,400 wind turbines could produce as much energy as Ireland uses in a year. However, given that electricity normally has to be used as soon as it is generated, in low wind periods, there would be a need for alternative generation. In order to deliver the cheapest electricity to the consumer, these alternative generation plants should be flexible power stations, rather than the large, inflexible and expensive baseload plant which has recently been built in Ireland. At other periods (e.g. a summer night when demand is low), there may be excess wind generation. However, this excess energycould be storedat pumped electricity storage facilities suchasTurlough Hill, exported (e.g. on the new interconnector planned) or demand could be encouraged to move around to avail of this “free” energy (as encouraged by the new SEM pool market structures). Wind energy is one of the cheapest of the renewable energy technologies. It can easily compete with new clean coal fired power stations and cheaper than new nuclear power. If we were look at the variable unit cost of electricity production then we would interpret the cost as being zero, i.e. there are no fuel or input costs, the energy itself is free. However in reality we interpret the actual cost per unit of electricity as represented by the long term spread per unit allocation of the very high initial capital costs, coupled with the day to day running of the wind farm e.g. administrative and maintenance costs. When the wind stops blowing, electricity continues to be provided by other forms of generation, such as gas or coal-fired power plants. This is made possible by sophisticated generation planning and the interconnection of power plants through the national grid. In order to ensure security of supply the system has to be able to cope if one of these goes out of action. The all-island grid study has shown that it is possible to deliver at least 42% of Ireland's energy from renewable sources. There are many opportunities for employment within the industry. In 2009 IWEA commissioned a report from Deloitte entitled "Jobs and Investment in Irish Wind Energy". This report showed that the Irish wind energy sector is capable of supporting more than 10,760 jobs through direct and indirect involvement in the sector. This is based on Ireland meeting our renewable energy targets in 2020. IWEA believes that the development of an export regime in Ireland will allow up to 28,000 jobs to be created in the sector, providing the appropriate measures are in place to allow the sector to grow. The types of jobs in the industry include project development, planning, construction, operation and maintenance of all wind farms as well as opportunities in support services such legal and financial roles. The credible peer-reviewed science, and various government reports in the U.S., Canada, Australia and the U.K. refute the claim that wind farms cause negative health impacts. An abundance of information on the various government and private reports that have come to similar or identical conclusions can be found in the articles below and the links they provide. But the important thing to remember is this: because wind power displaces emissions of air pollutants and toxic materials like mercury, its effect on public health is strongly positive.